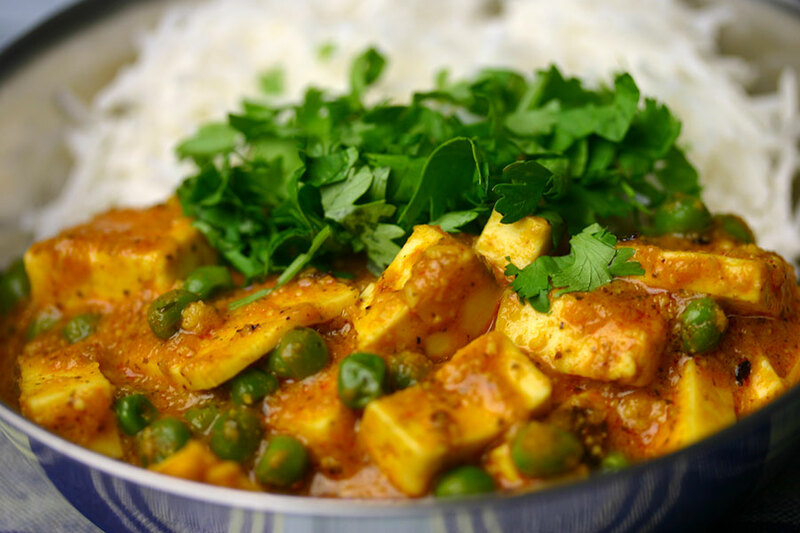 Mattar paneer is one of my favourite curries to make at home. It’s just never as fresh when you order it in a restaurant. The peas will have gone a bit grey and sad looking, and the paneer will be rubbery. More often than not, they will have added cream as well, which seems unnecessary in a curry that contains cheese. In a food processor, blitz the onion, garlic, ginger, green chilli, tomato paste, cinnamon, peppercorns, cloves, coriander seeds, cashews and coriander leaves into a smooth paste. Heat the sunflower oil in a heavy pan over medium. Add the cumin seeds and sauté for 15-20 seconds, then add the curry paste. Cook for few minutes, then stir in the turmeric, garam masala and additional chilli powder, if using. Add the frozen peas and water, and bring to a simmer. Cook just until the peas are hot and the sauce has thickened. Season to taste. Stir in the paneer, cover and simmer a few minutes more, until the paneer is heated through. Serve immediately with basmati rice or chapatis. I have always wanted to try this dish at home, but no paneer available here. suggest a good substitute and how much is a block? A block of paneer is about 200-225g. If you can’t find paneer, you could try a very firm tofu, or haloumi cheese maybe? It has to be something that keeps it’s shape when simmered in the sauce. I’ve made it a couple of times before with milk and lemon juice, but didn’t achieve the same texture the store-bought stuff has. It is, or like that solid ricotta you sometimes see, or halloumi (though less squeaky). It doesn’t have much taste, but absorbs the flavour of the sauce you cook it in.